← Reese’s Peanut Butter Cup Christmas Trees, the original, plus two new sizes! Yesterday, I shared Reese’s Peanut Butter Cup Trees in three different sizes and started making an edible winter scene. The project needed something other than trees. The solution was simple and now seems so obvious to me … can’t believe that I didn’t think of it a long time ago! 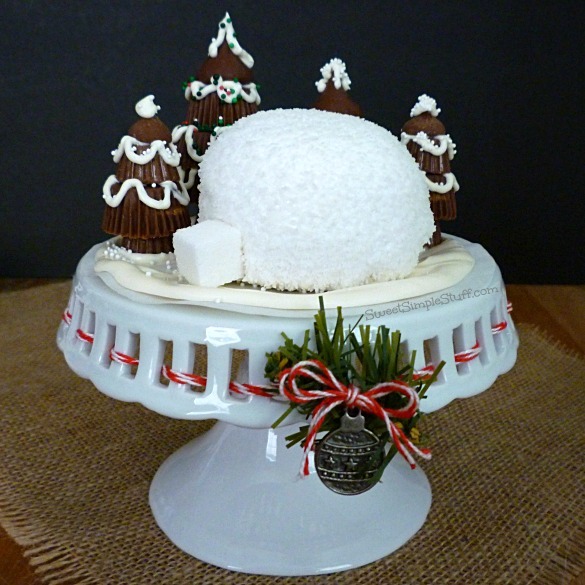 Today … the finished project … Snowball Igloo in the Forest! 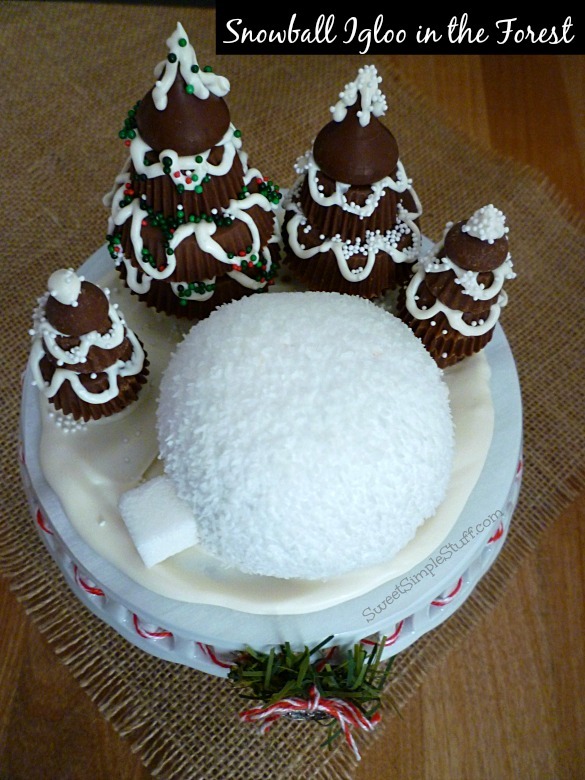 A few weeks ago, my sister-in-law asked me if I considered doing something with Hostess Snowballs. I really didn’t give it too much thought, until I was at the grocery store … saw a display of Snowballs … immediately thought igloo! But I already had too much on my plate … asked myself, what would I do with an igloo … maybe next year. 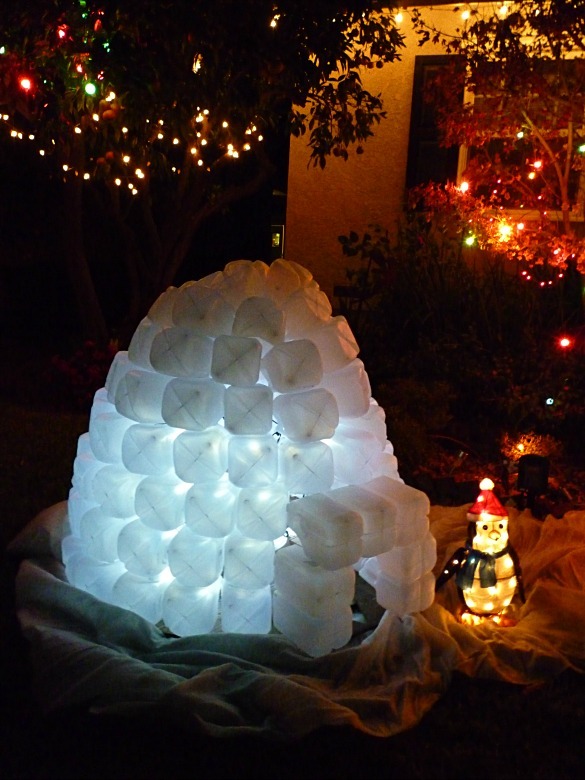 A few days passed and I was mentally putting the winter scene together … igloo … it needed an igloo! Back to the store I went! 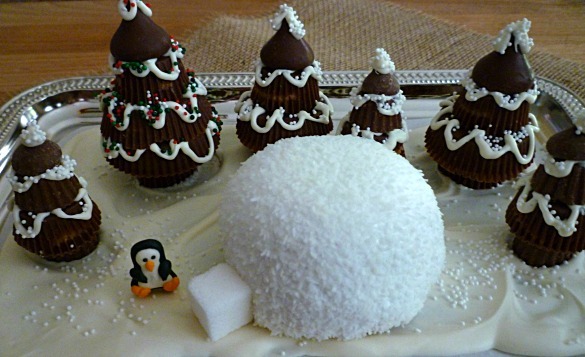 So, after you make the trees and arrange them in the melted candy snow, let the candy harden up … place a Snowball where you would like it and a sugar cube as a “doorway” to the igloo. Use a dot or two of melted candy to hold the Snowball and sugar cube in place. With Christmas Day less than a week away, I thought that some fast and easy projects would be appreciated. This is one of those ideas that would make a nice gift for neighbors, friends or anyone that you want to give a little handmade something … inexpensive too! The first winter scenes were given to some girl friends … we met at Starbucks. It was both funny and flattering when a customer asked if she could take a photo! This one is being delivered today … I used a tray from the Dollar Tree and added a royal icing penguin from my stash! I wrapped it up in cellophane, tied it with a red ribbon … easy peasy! Now, I need to work on the snow that I tried to create! Thank you so much Barb 🙂 I wish the same for you and your family! Oh yes -I remember the milk jug igloo from last year. It is oh-too-cute. Bet you’re the only one in the world with one and bet lots of folks stop and take photos. It’s just priceless, especially with the lighted inside.= and the happy little penguin inhabitant showing off his “house”. Hi Tavette! It’s so nice to hear from you again 😉 We do enjoy our igloo … several people have stopped by and told us how much then like it too! I think that Mr. Penguin may “decorate” his home next year! I love to hear from you! The Igloo came out great and I love the winter tree and igloo scene. That is Absolutely Adorable and sooooo creative. I should had sent you a couple of small polar bears to go with your igloo. Love your cake stand by the way. I have a thing / collection of cake stands. I do remember your milk jug igloo. Nice to see the finished project.